Take a look at some of the health benefits of microgreens. If you keep up with any food trends, you have probably heard about microgreens. Microgreens have become a regular garnish to many foods in different kinds of restaurants all over the place. They add a special color, flavor, and crunch to any meal, especially sandwiches and salads. Luckily, growing your own microgreens is pretty easy so that you can have this superfood garnish at home whenever you want. You might wonder, however, if microgreens are really worth the hype. Are microgreens healthier than their full-grown counterparts? For the answer to this question and for even more microgreen facts, keep reading this article! Microgreens are any kind of vegetable that has been harvested between 7 and 14 days after germination. This results in a small green between one to three inches tall with a concentrated nutrient profile. Microgreens have grown in popularity because they can be grown quickly, are cost-effective, and can be grown and harvested all year around. Keep reading to find out some of the benefits of these mighty little green guys! Microgreens are extremely rich in a number of nutrients and are more nutrient-dense than their mature forms of vegetables. Most types of vegetables have a diverse population of nutrients, including vitamin K, vitamin A, vitamin C, manganese, and folate. Microgreens contain between four and 40 times more nutrients by weight than their fully grown, mature counterparts, so including a few servings of microgreens a week into your diet can help you maintain your good health. Eating more vegetables has been linked with a reduced risk of heart disease and heart disease risk factors. 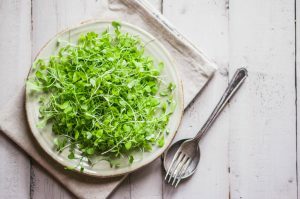 If you couple eating microgreens with a healthy diet, lifestyle, and regular exercise, these small but mighty plants can keep your heart strong and healthy. In addition to the many nutrients they contain, microgreens also contain polyphenols. Polyphenols are natural chemicals that serve as antioxidants. They help prevent the buildup of free radicals which can cause damage to cell walls. Not only are microgreens super healthy for your body, but they are pretty easy and convenient to grow and harvest yourself. Even novice gardeners can grow these, and you don’t even need a garden to do so! They can even be grown inside if you have water, soil, seeds, and a window with sunlight. Germinate your seeds and harvest before 14 days and voila! You have a healthy, rich garnish that serves as the perfect accompaniment to any home-cooked meal. More Microgreen Questions? Baywater Farms is Here to Help! Baywater Farms is a family owned and operated farm that services Baltimore, Washington, Hyattsville, Salisbury, and Maryland and Delaware beaches. We grow all types of things like hydroponic lettuce, heirloom beefsteak tomatoes, shishito peppers, spring mix, custom grows, radish mix, Maryland fish peppers, and much much more. Our trained professionals will help you with whatever you need. This entry was posted on Friday, April 12th, 2019 at 1:04 pm. Both comments and pings are currently closed.